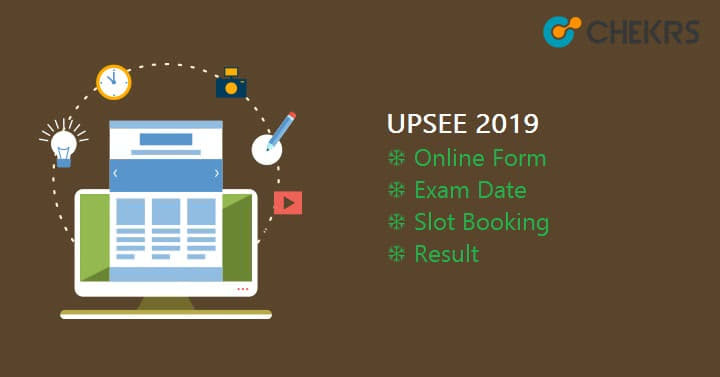 UPSEE 2019 is the popular exam name across the state of Uttar Pradesh. The complete name of UPSEE is ‘Uttar Pradesh State Entrance Examination’. This exam is conducted by Dr. A. P. J. Abdul Kalam Technical University of the state. Latest Update: UPSEE 2019 Answer Key Released on 21st April. Check the link at the Bottom of the post. Latest Update: UPSEE 2019 Registration closed!! Admit card will be released on 15th April. Latest Update: Notification Released!! UPSEE Application Form Filling Process will start from 2 PM Today. Get Ready for It. Latest Update: UPSEE 2019 Schedule Announced!! Registration will start from January 23. Latest Update: UPSEE 2019 Exam will be conducted on 21st April 2019. The UPSEE has to be taken by students who are willing to take admission in the university for B. Tech./ B.Arch./ B.Des./ B.Pharm./ BHMCT/ BFAD/ BFA/ MBA/ MBA(Integrated) / MCA/ MCA (Integrated) and a few of the lateral entry admission in technical courses. Also, the exam can be given by aspirants from across nation willing to take admission in the prestigious colleges and universities belonging to the state. Here, the article throws light on the key information related to the exam through which it will be easy for every reader to take actions accordingly. The article here sums up information such as eligibility, application process, important dates, exam pattern & syllabus, the result and a lot more events meanwhile the exam. Nowadays, just like other exams, major processes of the exam have been made online. Thus keeping a check on UPSEE 2019 Dates is must for all of the aspiring students. However, quick and easy approach has been provided straight through the UPSEE Brochure. As through the exam, admissions are rewarded in prestigious institutions, one has to maintain the minimum required standard set for the exam. In colleges, admission is given in the first year and as the lateral entry. Admissions for the first year are given through exam; however, for second year students are given direct admission which is totally subject to vary as per terms and conditions. MCA(Integrated) Qualified 10+2 with minimum 45% marks in aggregate; 40% for SC/ST from recognized board. MCA Candidate must have passed Mathematics at 10+2 level or Graduation level. Engineering Diploma holders or B.Sc. Now that aspirants have known their eligibility criteria, in order to precede further filling application form is more important. The process can be completed through UPSEE Online Application Form only. The willing aspirants have to submit their application form earliest possible without any delay in the UPSEE Application Form Last Date. We will be facilitating direct link, but make sure to follow the given steps while UPSEE Apply Online. From the home page find and click on the link to Online Applications. A new page will open up for the process of registration. Complete the process of registration by clicking on the link given next to the option. Use valid details for the registration process. Once done enter your registration number, DOB and mobile number to proceed. The application form will appear, click on it and submit all details as asked. After completing, recheck and click on the submit options. Note: The application forms are subject to get rejected if found filled with incorrect/improper details. The UPSEE Exam Pattern is the most important for all the candidates as through it one can know and evaluate how hard and up to what level one has to prepare. Also, it is as the UPSEE is the common exam for admission to various courses, the exam for each will be conducted separately. Each of the exams has been named as Paper 1, Paper 2, Paper 3 and so on. The list will help all aspirants to know which paper they have to prepare for. Also, a few of the papers are likely to be conducted online while a few will require paper and pen test. Thus referring to UPSEE Paper Pattern 2019 is the must. The syllabus is the most crucial while preparing for the exam. Through the UPSEE Syllabus, in any case, it will be more beneficial to clear the exam. The aspirants from all fields can get their latest and detailed syllabus through updates provided by us. One can easily get the notifications for their choice of the exam by taking the subscription. The exam dates for the exam are likely to extend and conducted on different dates. Hence it is only the UPSEE Admit Card through which one can know the schedule of their exam. Without admit card no entry will be permitted to any candidate. Also as the exam will be conducted in different cities, planning for the same will be made easier through it. UPSEE Hall Ticket 2019 will be provided to all a few days earlier to their respective exam dates. Those applicants whose application forms will be accepted can only download their admit cards. The UPSEE 2019 Result and understanding of marking scheme for all students is very vital in the process. All appearing candidates will be able to check out their result in the month of June. Merit list will be prepared separately for aspirants of each course. However individual score card will also be provided for UPSEE Result at the portal. Here we have made the entire process easier and thus direct link to download the result will be made available along with the notification of UPSEE Exam Result Date.